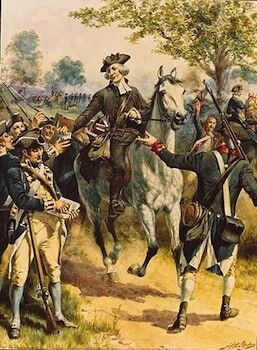 The Battle of Hanging Rock (August 6, 1780) was a battle in the American Revolutionary War that occurred between the American Patriots and the British. It was part of a campaign by militia General Thomas Sumter to harass or destroy British outposts in the South Carolina backcountry that had been established after the fall of Charleston in May 1780. One of these outposts was established at Hanging Rock, in present-day Lancaster County south of Heat Springs. The most northerly of the British posts, it was well fortified with more than 1,400 British troops, including the 500 man Prince of Wales American Volunteer Regiment, a Loyalist unit of the British Army, local Loyalist militia, and some dragoons from the British Legion. These forces were under the overall command of Major John Carden. The Americans were under Brigadier General Thomas Sumter, commanding troops made up of Major Richard Winn’s Fairfield regiment, Colonel Edward Lacey’s Chester regiment, Colonel William Hill’s York regiment and Major William Richardson Davie of the Waxhaws of Lancaster county with Col. Robert Irwin’s cavalry of Mecklenburg county, North Carolina. On August 1, 1780, Sumter launched an attack on the British outpost at Rocky Mount, west of Hanging Rock on the Catawba River. As part of this attack Sumter detached Major Davie on a diversionary attack on Hanging Rock. Davie attacked a fortified house, and captured 60 horses and a number of weapons, while also inflicting casualties on the British. This, however, did not prevent the British from sending troops from Hanging Rock to reinforce the garrison there. After his assault on Rocky Mount failed, Sumter decided to make an attack on the weakened Hanging Rock outpost. Sumter decided on a plan of attack of assaulting the camp in three mounted detachments. The initial assault was made early in the morning where Winn’s and Davie’s men completely routed Bryan’s corps. Capt. McCulloch’s company of the British Legion, after presenting a volley, was also routed by Sumter’s riflemen. The Prince of Wales Regt. also came under heavy fire and suffered very severe losses. Part of the Prince of Wales Regt then came up, and having cleverly deployed themselves in some woods, checked the rebel assault with a surprise crossfire. This allowed the British to draw up in a hollow square in the center of the cleared ground, and to further protect themselves with a three-pound cannon which had been left by some of Rugeley’s Camden militia. In the heat of the battle, Major Carden lost his nerve and surrendered his command to one of his junior officers. This was a major turning point for the Americans. At one point, Capt. 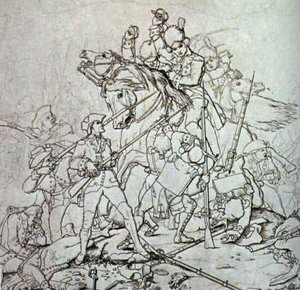 Rousselet of the Legion infantry led a charge and forced many Sumter’s men back. Lack of ammunition made it impossible for Sumter to completely knock out the British. The battled raged for 3 hours without pause, causing many men to faint from the heat and thirst. At the end, the British had lost 192 soldiers; the Americans lost 12 killed and 41 wounded. 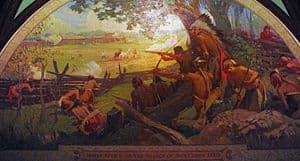 A group of Americans came across a storage of rum in the British camp and became so drunk they could not be brought back into the battle; thus, the intoxicated Americans left the field of battle and marched back to the base camp at Waxhaw. The battle site has been listed on the National Register of Historic Places. It is managed by the South Carolina Department of Natural Resources.